I've said it before and I'll say it again, South Park is downright flat-out hilarious! This latest DVD release of those foul-mouthed children from Colorado is no exception. South Park - Imaginationland contains South Park's first every trilogy, which basically means one story spanned over three episodes. Titled "Imaginationland", these three episodes take us to places and jokes that nobody could see coming. We start off finding Eric Cartman and Kyle Broflovski in a bet as to whether or not Cartman really saw a leprechaun... and strange as it may seem, Cartman wins. Not by deception or trickery, but because they boys actually do witness for themselves a real live leprechaun. I won't tell you what the stakes are, because... well, because it just wouldn't be appropriate to mention here. But needless to say, Kyle does NOT want to pay up. Fortunately for Kyle, fate intervenes. Stan, Kyle, Kenny, Butters, and Jimmy encounter a magical man who whisks them away to a place called Imaginationland, where all imaginary creatures live. And I'm not talking generic imaginary characters, or even just South Park imaginary characters. Nope, you'll find Imagination land populated by all sorts of cartoon characters, such as Voltron, Optimus Prime, Smurfs, Thundercats, Strawberry Shortcake, Jack Skellington, Astro Boy, Orko (from He-Man), Count Chocula, and well you get the idea. I'm sure you'll want to constantly pause the DVD just to see all the different characters they included. Unfortunately, our trip down memory lane is cut short when a terrorist attack suddenly throws everything into chaos. It starts with suicide-bomber, and continues on with a machine gun massacre. What follows is a scene right out of modern-day war movies, except with dead and wounded imaginary characters. But that doesn't mean they shorted us on all the nasty blood and guts! I don't think I'll ever be able to forget seeing Charlie Brown getting his leg blown off, or watching Ronald McDonald as he calmly squats down to pick up his bloodied, severed arm while in a daze. Talk about a mixed reaction, I was both horrified and laughing all at the same time. How do they think up this stuff?! Fortunately, Stan, Kyle, Kenny, and Jimmy are able to escape with the help of a flying imaginary character... unfortunately, Butters gets left behind, and the boys have to watch the terrorists kick and beat him while they fly away to safety. But it gets even worse. The pentagon learns of this terrorist attack on imagination land, and sends in a team via a system that parodies Stargate. Of course, things don't go so well (would it be funny if it did?). I don't want to give too much away, even though you'll still laugh knowing what happens, but it's just better to see it for yourself. Oh yeah, and during the entire trilogy, Cartman is on his own quest to do whatever it takes to get Kyle to pay up on their bet. Imagination land is one of the best episodes (or series of episodes) in recent memory, but this release also contains two additional bonus episodes, Woodland Critter Christmas and Manbearpig. Both episodes are also quite funny, though I wouldn't classify them as among the best. I'm sure the reasoning behind selecting these specific ones is that they both feature imaginary creatures that not only show up in Imaginationland, but play a role in it as well. There is also a commentary by Matt and Trey, creators of South Park, though I haven't had a chance to listen to it yet. But it matters not, as these episodes are most definitely worth owning regardless of the extra features, because THEY WILL MAKE YOU LAUGH! The only question is, should you buy this release or just waith for the season 11 box set to come out, whenever that may be. In this uncensored, never-before-seen directors cut, the doors of the worlds imagination are thrown wide open and the boys of South Park are transported to a magical realm in their greatest odyssey ever. Stan, Kyle, and Butters find themselves in Imaginationland just as terrorists launch an attack that unleashes all of mankinds most evil characters imaginable. With the worlds imaginations spinning out of control, the government prepares to nuke Imaginationland to put an end to the chaos. Racing against time to prevent nuclear annihilation, the citizens of Imaginationland realize their only hope of salvation lies with the unlikeliest of heroes: Butters. Ignoring the impending apocalypse, Cartman goes all the way to the Supreme Court to get justice for his case of dry balls. 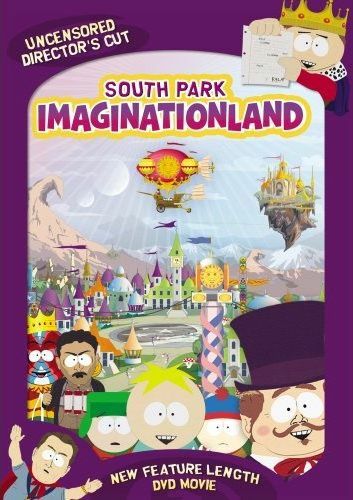 Released via COMEDY CENTRAL Home Entertainment and Paramount Home Entertainment, "South Park's Imaginationland" DVD arrives in stores nationwide on Tuesday, March 11 and will also be available at http://www.southparkstudios.com/imaginationland/. "South Park's Imaginationland" is a feature-length DVD movie with all-new material added. For the first time ever on DVD, the series is completely uncensored and features audio commentary from the co-creators and executive producers, Trey Parker and Matt Stone. The DVD release also includes storyboards. In addition, fan favorite episodes "Woodland Critter Christmas" and "Manbearpig" are part of the bonus materials. Launched in 1997, "South Park," kicking off its 12th season on Wednesday, March 12, remains the highest-rated series on COMEDY CENTRAL. "South Park" regularly airs on Wednesdays at 10:00 p.m. and repeats Wednesdays at 12:00 a.m., Thursdays at 10:00 p.m. and 12:00 a.m. and Sundays at 10:00 p.m., 11:30 p.m. and 3:00 a.m.
Trey Parker and Matt Stone are co-creators and executive producers of the Emmy® and Peabody® Award-winning "South Park" with Anne Garefino as executive producer. "South Park's" Web site is www.southparkstudios.com.